Because headaches are so common, most people think they are a normal part of life. However, a persistent headache is a sign that something is wrong. The continual use of pain medication to combat headaches is akin to removing the warning light that alerts you to a problem in your car. Medication doesn’t solve your headache, it simply offers a short term solution to dull the pain. If you’re a sufferer of chronic headaches or migraines, you don’t need convincing that they’re one of the most painful, debilitating conditions you can suffer. Millions upon millions of dollars a year are spent on trying to find relief from this crippling illness. But what causes migraines? Headaches can result due to a variety of reasons including stress, poor posture, accidents, medications, environmental factors such as strong odours, pollution, and dietary irregularities. Perhaps one of the most overlooked cause of migraine and tension headache is the nerve irritation in the upper neck originating from poorly functioning spinal joints – or what we call vertebral dysfunction. Since the nerves of the upper neck supply areas of the scalp and face, irritation to these nerves can and often lead to headache. Basically it’s a decrease in oxygen to the brain. If the brain receives less oxygen per millilitre of blood, it will simply increase the amount of blood flow to increase the overall amount of oxygen received. In order to increase the amount of blood flow, it must dilate the blood vessels that supply blood to the brain. When these vessels dilate, it stretches pain fibres that wrap around the outside of these vessels. When these pain fibres are stretched they are activated and start sending pain signals into the brain, resulting in your perception of pain. Headaches and migraines may also be caused by a misalignment or dysfunction of a vertebra in the top of the neck. This then causes inflammation and tension of the joints, muscles, and blood vessels at the base of the neck, which then transfers pain up into the skull. 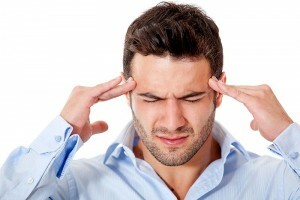 Tension headaches and migraine are the most common forms of headache and cluster headaches are most rare. Other types of headache include sinus headache, rebound headache, and exertion headache.